This coverage includes most health care services covered under the provincial/territorial health insurance plans available where the child is residing. Among the included services are in-patient and outpatient hospital services; care provided by medical doctors, nurses, and other licensed health care professionals; laboratory and ambulance services; some dental and vision care; and prescription medications included in the provincial/territorial drug plan. 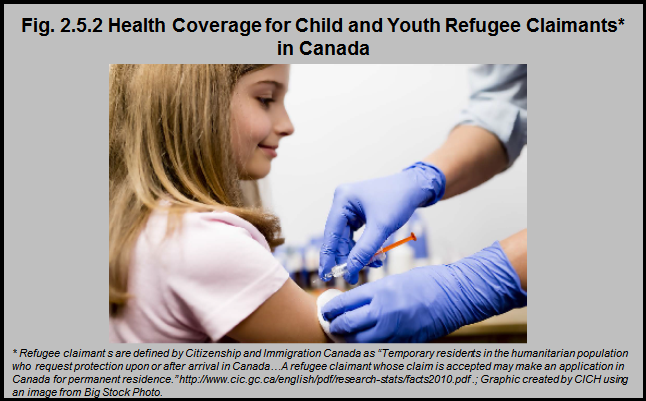 For a complete description of the coverage available to refugee children and youth in Canada, visit the Government of Canada website describing the Interim Federal Health Program. This information was updated in November 2014 to reflect new policies. The policies regarding the health care provided to refugees and refugee claimants changes periodically. The most recent information can be found on the Citizenship and Immigration Canada website. Child and youth refugees are eligible for the most comprehensive type of coverage available to refugees in Canada – Basic, Supplemental and Prescription Drug Coverage.